AT&T has announced it is following rival Verizon’s lead by offering shared data plans that let you pay one monthly fee for a bucket of wireless data to share across as many as 10 devices. The new data plans, called Mobile Share, will be available in late August, and current customers will not be required to adopt the new plans. Similar to Verizon’s Share Everything plans, AT&T’s new shared data plans include unlimited talk and text for all your connected phones, tethering capability, as well as free access to AT&T’s more than 30,000 public Wi-Fi hotspots. AT&T’s shared plans require you to own a smartphone first. Afterward, you can then add up to nine other devices including tablets, gaming devices, feature phones, laptops, netbooks and external broadband cards. Just like Verizon’s, the AT&T plans consist of three basic charges: a monthly data fee, monthly smartphone fee and monthly fees for every extra connected device. To get started you have to choose one of six data plans that include anywhere from 1GB to 20GB of monthly data. The more data you get, the cheaper your per-gigabyte and smartphone monthly charges will be, while the monthly charge for extra devices stays the same. Connecting a tablet to your account, for example, will set you back $10 per month, and a feature phone will cost $30 per month. These prices do not include initial device purchase costs. Let’s assume you want to use a data plan for one smartphone and one tablet, which choice is better: is AT&T or Verizon? The answer depends on how much data you want to use. If you use the most basic plan of 1GB per month, you’ll pay about five dollars more on Verizon ($100) than on AT&T ($95). 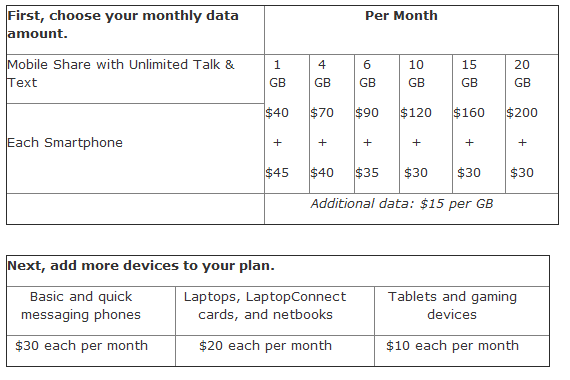 But as soon as you go up to 4GB (Verizon also offers a 2GB plan), Verizon and AT&T both cost the same at $120. Bandwidth hogs who need 6GB per month will pay $130 on Verizon and $135 on AT&T. And anyone needing 10GB per month (what exactly are you doing with your phone anyway? ), will pay $150 on Verizon and $160 on AT&T. These estimates are based on basic charges only and do not consider the many variables on carrier bills such as taxes and miscellaneous fees. Verizon’s Share Everything monthly data allowances go up to 10GB, while AT&T offers up to 20GB on Mobile Share. Verizon customers can add more data by paying $10 for an extra 2GB. Both AT&T and Verizon charge $15 for every extra gigabyte you use beyond your plan’s allowance. AT&T says current customers upgrading to new smartphones will not be required to adopt the new shared data plans. Verizon customers who currently have an unlimited plan and plan to upgrade to a new device will have to switch to the company’s Share Everything or tiered data plans unless they pay the full, unsubsidized price for their next phone, Verizon told PCWorld in May. Verizon’s Share Everything plans became available in late June. AT&T has yet to announce a specific date for Mobile Share beyond late August.